Time for Priebus to Go! About a week ago, both the Republican Liberty Caucus and the Virginia state chapter of the RLC issued press releases calling for the resignation of the chairman of the Republican National Committee Chairman Reince Priebus. The reasoning for this action revolves around the conflict that took place during the recent Republican Nation Convention in Tampa, Florida. For many Republican and conservative activists who only heard news of the convention via reports from the mainstream media, much of this article may come as a bit of a shock. However, behind the cheery exterior in Florida, there lurked a number of troubling accounts. Along these same lines, rather than unify the party behind Mitt Romney, the convention further drove a wedge between the Ron Paul and Romney supporters. For starters, early in the convention, many delegates from Maine who supported Ron Paul were stripped of their voting power. To make matters worse, although a candidate and elected official in the Republican Party, Representative Ron Paul was not allowed to speak on the convention floor. Lastly, in a move which must have been done out of spite, when delegates from each state cast their votes, the officially announced totals made no mention of Paul’s total. 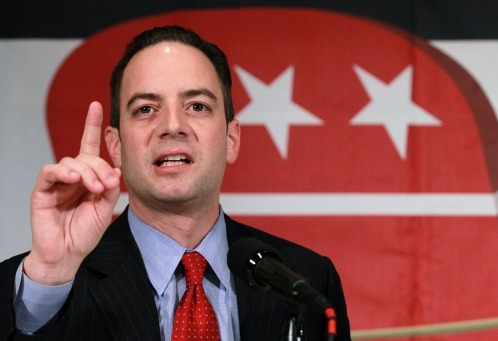 Therefore, as stated at the beginning of this article, as a result of the events that took place under the leadership of RNC Chairman Reince Priebus, the Republican Liberty Caucus and many state chapters of the RLC have issued a resolution calling for his resignation. We assert the primacy of the state parties in determining policy for conducting party elections, nomination of candidates and apportionment of delegates within their states without the interference of the national committee or any campaign or outside entities. We urge the Republican Party of Virginia State Central Committee, our State Chairman and our Republican National Committee representatives to act on this resolution and vote to return control of the party to the state parties and the body of party members. We urge members to take this resolution to their local unit committees for passage by said committees, and for Virginia Republican activists to endorse it. The unity of the Republican Party is in a sorry state due to the leadership, or lack thereof, of Reince Priebus and his confederates. Conservatives and libertarians have been demoralized and disenfranchised and his actions have harmed the party and its candidates in not only the 2012 elections, but for elections in the years to come. Partially as a result of the devious actions which took place at the convention, most Ron Paul supporters I know are unifying behind Libertarian candidate Gary Johnson and, try as I might, I can’t say that I blame them. I’ve said it before and I’ll say it again. Nothing defeats the Republican Party quite as well as the Republican Party. We should never forget that Reince Pribus bears a considerable portion of this blame. It is time for Priebus to go! 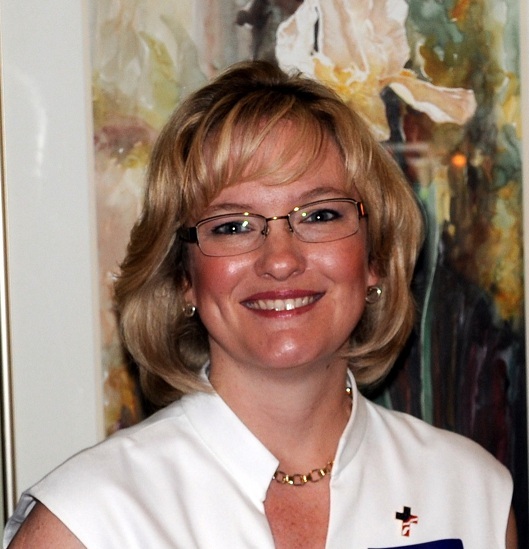 VC Note: Jamie Radtke, if you will recall, sought the GOP nomination for a U.S. Senate seat representing Virginia earlier this year along with several candidates. She finished second to former Senator and former Governor George Allen. Unlike the other candidates, after the primary finished, she indicated that she would endorse Mr. Allen if he pledged to hold to several principles. To follow is an email I received from Jamie Radtke a few moments ago. I hope this email finds you well. After a year and a half of eighteen hour days campaigning on the road before the Primary, I made the most out of the summer by spending much-needed quality time with my husband and children. I’ve enjoyed every minute of eating three meals each day at our own kitchen table, playing games, swimming, hiking, and laughing with my family. It has been wonderful! At the same time, I’ve spent a lot of time praying and reflecting on what my campaign accomplished, and on what you’ve meant to me during the campaign. I shared my thoughts on my personal Facebook page recently. If you missed it, the Virginia Conservative blog [VC: Not me, but rather someone else who uses the Virginia Conservative name.] posted it, so you can read it there. I received a tremendous response from my posting, and I would love to hear from you as well. However, I am writing to you now for a different reason. Please allow me to explain. It’s no secret I’ve been a harsh critic of George Allen’s past record of spending and debt. As you know, I have always pushed for responsible fiscal policy to benefit families, businesses and our nation as a whole. Win or lose – – a primary election challenge to George Allen was important to confront the issues of excessive spending and accumulating debt in our own party. Likewise, I didn’t rush to endorse George Allen after he won the Republican Primary in June, simply because I couldn’t endorse any candidate who didn’t have the strong resolve to tackle our debt crisis. I endured some criticism for not endorsing George Allen right away, but I’m a big girl and I’m not shaken by it. I don’t take endorsements lightly and I simply refuse to engage in politics for politics’ sake. This isn’t a game; the future of our nation is on the line. Several weeks ago, I met with George Allen and his campaign manager. I explained the concerns you and I share about his prior record of spending and debt in Washington. As you’ve heard me say many times, “if we don’t deal with spending, nothing else is going to matter.” You know I’m a crusader on this issue. During our meeting, I said I have always appreciated George Allen’s opposition to higher taxes and his determination to exploit the energy resources we have in our Commonwealth. However, I asked him to define concrete proposals to tackle the looming financial crisis. In short, I offered an endorsement for George Allen on two conditions. First, he had to put on paper substantive plans to curtail spending and reign in the federal debt. Second, I needed to see him publicly herald those plans in his campaign as a demonstration of his commitment to them. To his credit, he has done both. Recently George Allen sent me a four-page document detailing short and long term proposals to address spending and debt. Frankly, I was encouraged by what it contained. We would benefit greatly from many of the items he proposes, like capping spending at 19% of GDP, stopping earmark spending, freezing federal hiring, rolling back to 2008 spending levels, blocking Medicaid grants to the states, reforming Medicare to return control to individuals, reforming social security by raising the age for the younger generation to keep it solvent for them, and supporting the REINS Act to stop the very expensive, freedom-robbing overregulation by federal agencies. Since putting his plans on paper, he has promoted it in several public forums – – promising to work toward solving our nation’s financial crisis. I’ve heard positive reports from several people who’ve seen him promote his plan in private meetings as well as public forums. I’m encouraged by Allen’s substantive proposals, and I believe you will be, too. Allen’s proposals are far better than the government-driven, tax-and-spend ideas advocated by Tim Kaine and Barack Obama. Nobody should believe that Tim Kaine is fiscally conservative! I have no doubt that Tim Kaine and Barack Obama, if elected again, will destroy our economy through their job-killing Keynesian economics that suppresses individual achievement. You only must look back at the last four years to see the abuse we have taken under their failed leadership. You can read, for yourself, Allen’s positive plan for fiscal recovery here. Based on George Allen’s newly detailed plans to restore fiscal sanity to Washington, I endorse George Allen. I wanted to write to you, to let you know first. I’m excited about the opportunity to help take this message across Virginia. Voters need to know that George Allen is committed to responsibly and immediately tackling this looming financial crisis. I hope you will join me in helping George Allen defeat Tim Kaine over the next few weeks. You did so much for my campaign by knocking on doors, contributing financially, and phone banking. In the counties where we had a strong ground game, we did very well. I don’t have to exaggerate to say that this election could literally come down to a few thousand votes, since all the pollsters are projecting a very close outcome. Your help could be the difference in avoiding further fiscal calamity and greater threats to our freedoms. I will be doing a number of events between now and November 7th. I hope you will join me in promoting fiscal sanity in this November election and offer your support to George Allen for U.S. Senate. I look forward to seeing you on the campaign trail! Paul Ryan, the Republican Representative for Wisconsin’s First Congressional District and Mitt Romney’s running mate, made a campaign stop at the Rockingham County Fair Grounds on Friday. His visit marks the first of any presidential or vice presidential candidate to the central Shenandoah Valley. Besides Representative Ryan, speakers also included: Delegate Tony Wilt of Rockingham County, Delegate Steve Landes of Augusta County, State Senator Mark Obenshain of Harrisonburg, and Representative Bob Goodlatte of Roanoke. The event itself was quite well attended. Most estimates I’ve read peg the audience about 3,000. Like the recent Obama rally in Charlottesville, each person had to pass through “airport style security” overseen by both the Secret Service and the TSA. Reaction to the gathering was mixed. Although most of the people that I spoke with enjoyed Ryan’s speech, the event was plagued with a number of shortfalls. First, no one could bring in liquids, which was expected. However, the fact that one could not even get a cup of water without paying for it seemed completed absurd. Would a person have to suffer through their thirst if he or she could not pay $2.00 for a beverage? A view of a portion of the crowd and the fence that segregated attendees. 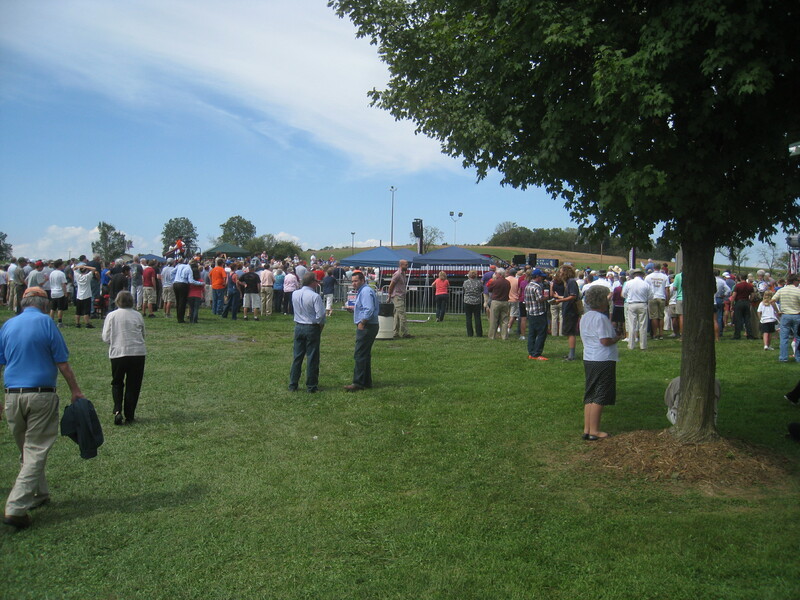 Second, the venue did not allow for a majority of the spectators to see Paul Ryan. The organizers set up a ring of fences around the platform and only a portion could enter this circle. Although raised, the platform was not nearly high enough for many people to even catch a glimpse of the man who could very well be our next vice president. However, one positive aspect, as compared to the Obama event, was that the police did not close down traffic in a highly central location for the better part of an hour, which would have wasted the time of countless residents. Overall, I would rate Ryan’s event a success even though, as mentioned, there were several aspects that could have been and should have been handled in a better manner. So the next question is will any of the five presidential candidates: Barack Obama, Mitt Romney, Gary Johnson, Virgil Goode, or Jill Stein, make a stop in the Shenandoah Valley between now and the election? If you will recall, four years ago Barack Obama won the city of Harrisonburg after making a speech at JMU while John McCain merely sent a relative to the local GOP headquarters. After all, personal campaigning is an important element to electoral success and Ryan’s visit on Friday should serve to bolster the local Republican effort. Now how will the other candidates respond? Our first answer comes tomorrow when Libertarian Party candidate Judge Jim Gray speaks at JMU. 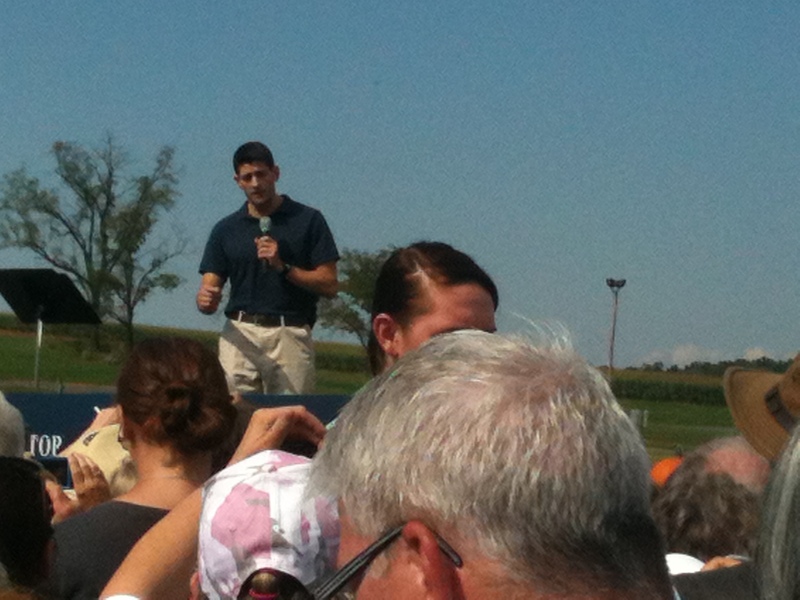 As a final note, I want to shout out a special thanks to Helen Shibut of Madison Liberty for the picture of Paul Ryan. As mentioned, I happened to be one of the countless spectators who could not get close enough to get a usable shot. 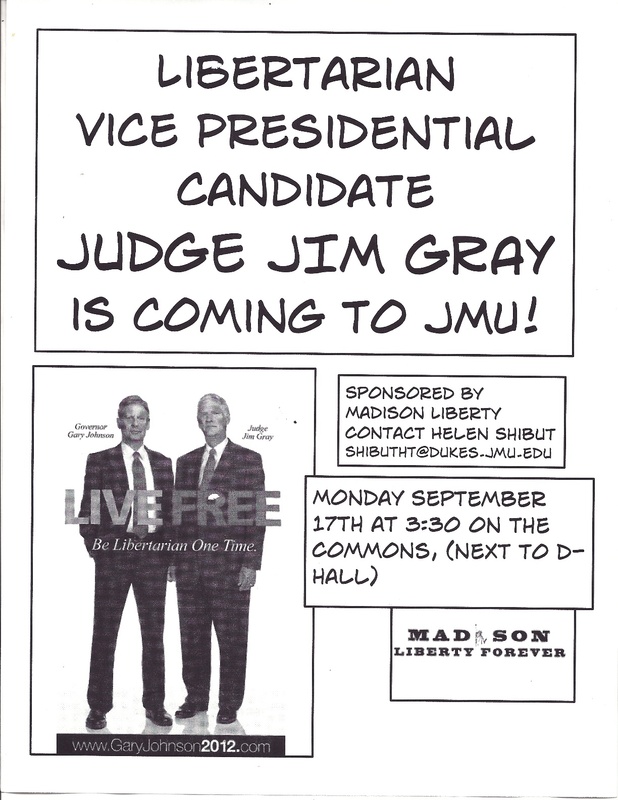 Tomorrow, Monday, September 17th, Judge Jim Gray, the Libertarian Party vice-presidential candidate, will be on the campus of James Madison University. Madison Liberty is hosting the event. As their name implies, they are a liberty-minded group of students at the university. The gathering itself will be taking place starting at 3:30 PM on The Commons, which is next to D-Hall. For non-JMU students, a parking pass is available at parking services, located in ground floor of the parking deck beside the football stadium on Champions Drive. Whether you consider yourself libertarian, conservative, liberal, some other political persuasion, or even those who are not particularly informed, tomorrow provides another excellent opportunity for the students of James Madison and the surrounding community to expand political dialogue and learn more about Gary Johnson and his running mate, Judge Jim Gray. You may have forgotten, but tomorrow is Constitution Day, the anniversary of the signing of our Constitution. How better to commemorate the day than by spending an hour with Jim Gray alongside a bunch of students who actively seek to restore and expand our freedoms? VC Note: To follow is a letter Morton Blackwell wrote concerning the rules changes that took place at the Republican Convention in Tampa, FL. Although it has already been posted on RedState, I thought that it would be of interest to many activists in Virginia, especially considering the questionable tactics employed against our delegates. Now that the national convention is over, many delegates and others have asked me to sum up my views on the controversy at the convention regarding The Rules of the Republican Party and where we should go from here. What happened regarding the party rules in Tampa was a totally unnecessary – but largely successful attempt – to concentrate and centralize more power at the top of the party and restrict or shut off opportunities for power in the party to flow from the bottom up. The effort was led by Ben Ginsberg, a member of the Convention Rules Committee from Washington, D.C., who represented himself as the spokesman for Mitt Romney’s Presidential Campaign. Earlier this year, Mr. Ginsberg worked for the Presidential Campaign of Michele Bachmann. In Tampa, he led the effort to make major changes in the party rules strongly opposed by Congresswoman Bachmann. Mr. Ginsberg is simply a man unencumbered by principles. For four years, the Republican National Committee’s Standing Committee on Rules carefully reviewed The Rules of the Republican Party and adopted changes to propose for adoption by the national convention. Then the Republican National Committee voted unanimously to approve the new rules proposed by its Standing Committee on Rules and sent them on to the Convention Rules Committee. At the Convention Rules Committee meeting, he proceeded to introduce and support many amendments to the newly-revised rules which had been approved the previous day by the RNC. The changes he proposed shared a common theme: to concentrate and centralize more power at the top of the party, and to shut off opportunities for power in the party to flow from the bottom up. Since these rules changes would go into effect for the 2016 presidential election cycle, none of Mr. Ginsberg’s power grabs would in any way help us elect Mitt Romney and defeat President Barack Obama in November. And I’m sure you agree defeating Obama should be our top priority this Election Year. But Ben Ginsberg’s efforts predictably enraged conservative Republicans who treasure the protections long incorporated in our national party rules. The record will show that during the Conventions Rules Committee meeting, as a member of that Committee from Virginia, I repeatedly warned Mr. Ginsberg that his power grabs would hurt the Romney campaign by outraging grassroots conservative and libertarian activists whom we want to support our candidates this year. Unfortunately, Mr. Ginsberg continued on his path. There are some folks who, if you give them a fur coat, think they’re King Kong. As anyone with relevant experience should have foreseen, when the Rules Committee report was presented for consideration to the National Convention, a thunderous “NO!” vote arose from the convention floor. Most of the news media and those of us in the convention hall agree that the vote on adopting the Rules was obviously close. Some believe the “NO” vote was louder, but Speaker Boehner ruled that the “ayes” had it. I was the youngest elected Goldwater delegate at the 1964 national convention. I have attended every national convention since, and I’ve represented Virginia on the RNC since 1988. Nothing like this has ever happened before in living memory at a Republican National Convention. When they were presumptive Presidential nominees – and when they were Presidents of the United States – neither George H.W. Bush nor George W. Bush ever attempted to undermine the means by which power within the Republican Party structure can rise from the bottom up. The operatives whom the Romney campaign put in charge of Rules matters seem to want the power to rule the national Republican Party, as Nelson Rockefeller used to run the New York State Republican Party. These operatives should be repudiated – and it’s not too late to do so. Later in this email, I’ll discuss some of the awful changes Mr. Ginsberg supported. But first, it’s necessary to stress how important I believe it is to elect Mitt Romney and defeat Barack Obama in November. My wife and I have supported Republican candidates every year in our 40-year marriage. This year, my wife and I have contributed at least five times as much money to Romney Victory, Inc. as we have ever given to any other campaign. Four years ago, I predicted in a posting which still can be seen on the website RedState, how bad a President Barack Obama would be. He has been even worse than I predicted. Barack Obama is a leftist ideologue who has filled his Administration with other leftist ideologues, and their policies are bankrupting our country and destroying many of our liberties. Mitt Romney strongly supports conservative principles – and he would undo the damage Obama has done. He would end the slide into national bankruptcy, restore threatened liberties, and put our country on the path toward economic growth and more job opportunities. It’s little short of tragic that some of his operatives blundered by setting up an entirely unnecessary, major controversy with grassroots Republicans at our national convention. Undoubtedly, the worst power grab initiated by Mr. Ginsberg was his ramming through a change in the Rules of the Republican Party, a new Rule 12, which permits the Republican National Committee to change national rules between conventions. The Democrats have had such a rule for years, and those in power in their party spend the periods between their national conventions fighting in their national committee over rules changes to benefit this or that faction, or this or that potential presidential nominee. We Republicans have avoided that by prohibiting changes in the rules between our national conventions. The office of the RNC Chairman is – and has to be – very powerful. A National Committee of 168 members, which meets for a few hours two or three times a year, can’t micro-manage the RNC. The RNC Chairman has the immense power of the purse and a large staff to influence the decisions of the RNC, so an RNC Chairman can get the votes of a super-majority of the RNC for just about anything he or she desires. But until now, the fact that the RNC Chairman must abide by stable party rules has served as the main protection for input by grassroots conservatives and libertarians. For practical purposes, the new Rule 12 adds to the power of the RNC Chairman (or to the White House when there’s a Republican President) the ability to change party rules at will. Over a number of election cycles, our party has struggled to avoid the front-loading of our delegate selection process, moving us closer and closer to a single national primary as states race to the head of the line to hold their primaries. Yet prudence dictates that there should be a reasonably long nomination process in order to properly vet all of our candidates. After special studies and much consultation, many serious party leaders finally came up with a workable solution. Party rules were changed in this cycle to prohibit winner-take-all primaries in March of presidential election years. March primaries had to in some way allocate delegate votes proportionally to the popular vote. The new system worked, and Mitt Romney is a better presidential candidate because of that experience. Mr. Ginsberg gutted the hard-won reform by ramming through a change in the rules to permit winner-take-all primaries in March. That’s a far cry from a process in which the best interests of our party are carefully discussed and considered. I have innumerable times over the years recruited new participants into the Republican Party by stressing the fairness, openness, and stability of our Republican rules compared to those of the Democratic Party. The way to treat newcomers to our party is fairly, politely, and even cordially. That’s what we do in Virginia. And that’s how to build and sustain a majority party. Among the many still-not-publicized rules changes rammed through the Convention Rules Committee by Mr. Ginsberg was one to raise from five to eight the number of states a presidential candidate would have to win in the nomination contests in order to have his or her name formally placed in nomination before the convention. Raising the bar was a gratuitous slap at prospective new participants in our nomination process. Despite his success in recruiting new volunteers, Congressman Ron Paul won a majority of the delegate votes in nowhere near five states this year. Mr. Ginsberg got the Convention Rules Committee to pass a rule change which would allow presidential candidates to remove national convention delegates who were legally elected under the party rules and laws of the respective states. This caused such a furor that a Minority Report to the Rules Committee Report seemed certain. That would have forced a debate on the convention floor and a vote of the entire convention body. A valid Minority Report required the support of 28 members – or 25% – of the Convention Rules Committee. Well over 35 signatures were certain, despite all available arm-twisting of Mr. Ginsberg and those who supported him on everything else. State parties, including Virginia’s, fiercely defended their right to elect their own delegates. The “compromise” was for Mr. Ginsberg to agree to take out the provision which would have given candidates the power to disavow and remove legally elected delegates. In place of that obnoxious provision was inserted a guarantee that delegate votes would go to candidates who won those delegate votes in binding presidential primaries, a matter which would have been routinely enforced under the existing rules. Conservatives continued to mount efforts to file two Minority Reports, but in the end, enough Rules Committee members were persuaded not to sign them or to remove their signatures. Neither had the required 28 signatures and one wound up with 27 valid signatures. Therefore no Minority Reports reached the convention floor. I should mention that Mr. Ginsberg moved one rules change which would have required the signatures of 40% of future Convention Rules Committees for a Minority Report to be considered on the convention floor. That would have rendered future Minority Reports virtually impossible because the signatures would have to be obtained and the Minority Report filed within one hour of the adjournment of the Convention Rules Committee. The opposition to this attempted power grab was so intense that Mr. Ginsberg withdrew his motion. There circulated in the media coverage of the Tampa convention a report that a late and wayward bus deliberately prevented the Virginia Delegates from arriving at the convention hall in time for me to take part in the final (usually pro-forma) meeting of the Convention Rules Committee held as the convention began. It is true that our Virginia bus got our delegation to the convention hall after the Convention Rules Committee meeting adjourned. But I never for a minute believed our bus had been deliberately delayed. One should not attribute to conspiracy what can adequately be explained by incompetence. You will recall that staggeringly bad transportation arrangements inconvenienced most of the states’ delegations that day. All in all, in most ways our 2012 convention was a roaring success. We presented great speeches by Mitt Romney and his brilliant choice for running mate, Paul Ryan. Other great speeches by Anne Romney, Marco Rubio, and a galaxy of others put our party’s best feet forward. The 2012 Republican Platform clearly expressed our conservative and liberty-loving principles. My strong advice is for all of us to work tirelessly and give generously to our national campaign. Everything is on the line this year. And there’s another reason for solid conservatives to contribute more time and money now. I believe we shall win this election, and then there’s the important matter of staffing a new Administration. I worked full-time in the Presidential Personnel Office of President-elect Ronald Reagan and then for three years on his White House staff. An incoming administration tends to hire people who contributed significantly to winning the election. If we expect a new President to hire a lot of principled conservatives and libertarians, we should maximize the number of principled conservatives and libertarians who have credentialed themselves by taking part in the Mitt Romney campaign. And then, in 2016 we can work to repeal the current Rule 12 – and reverse the other mistakes incorporated in the new rules last week. This evening, the Top of Virginia Regional Chamber of Commerce held their annual Hob Nob event in Middletown, Virginia. Unlike last year, which was marred by rain, overall attendance was up by around 30 to 40%. 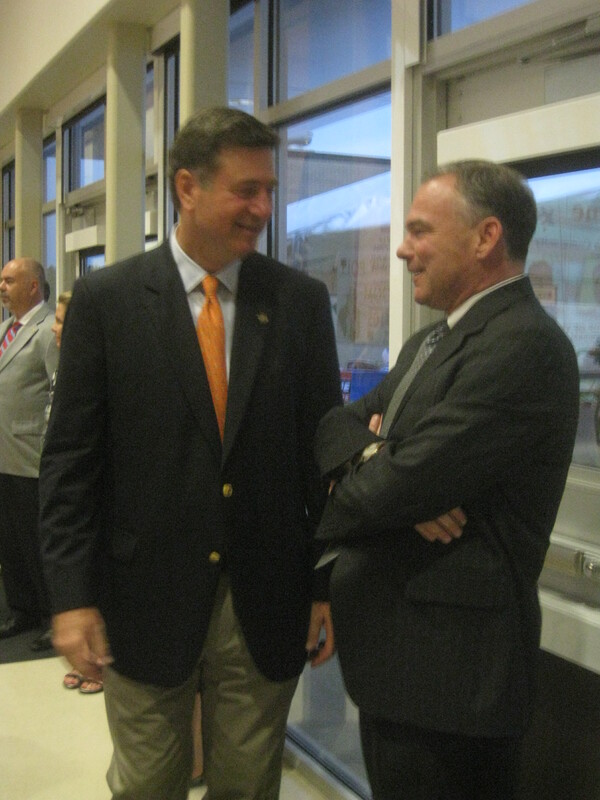 The main attraction was both former Governors Tim Kaine and George Allen. Each gave a brief speech, as did two members of the General Assembly who spoke on behalf of the campaigns of President Barack Obama and former Massachusetts Governor Mitt Romney. 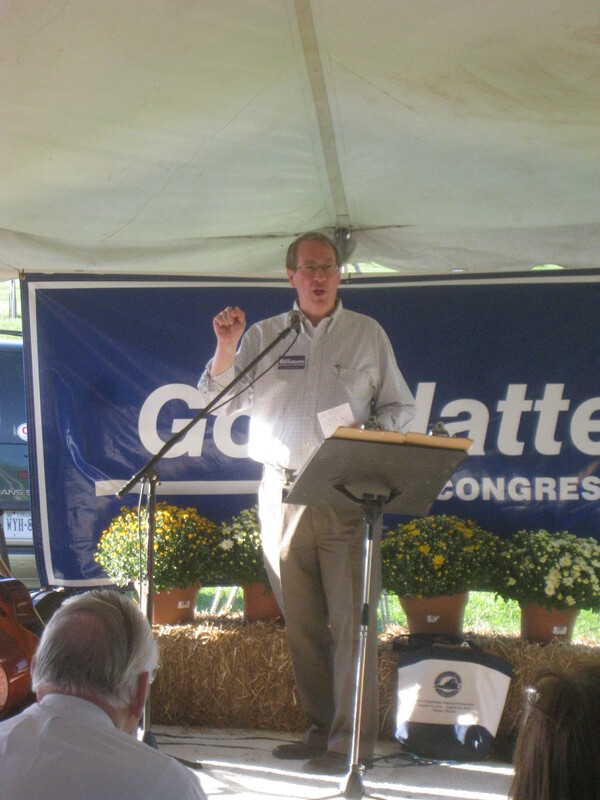 Although not offered a speaking role, Representative Frank Wolf, his Democratic and Independent opponents, Kristin Cabral and Kevin Chisholm, some of the statewide 2013 candidates, and a host of office seekers from either the city of Winchester or Frederick and Clarke Counties were also brought up on stage. 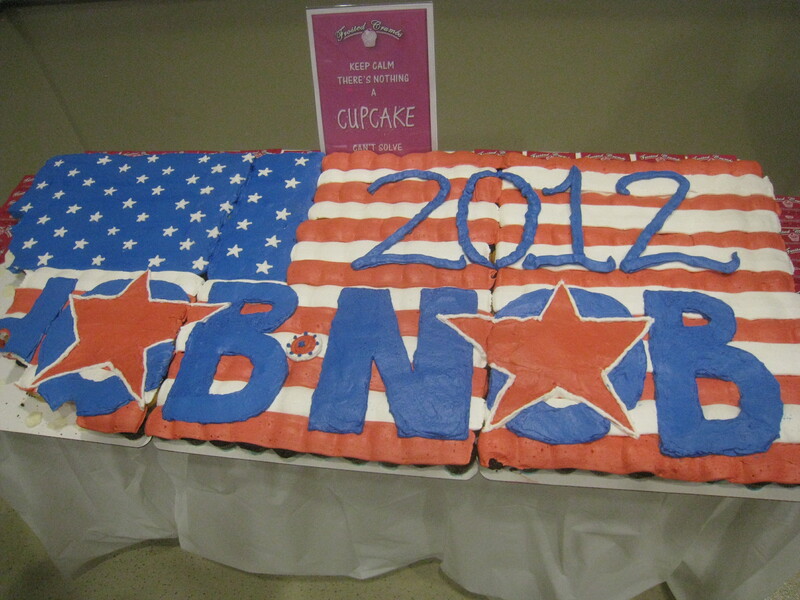 Each attendee to the Hob Nob had the option to participate in the 14-question straw poll with 211 choosing to do so. For president, Mitt Romney emerged victorious with 127 votes or 60.2% as compared to Barack Obama’s 76 votes or 36%. Unlike Virginia’s November ballot, none of the other candidates were listed. Nevertheless, write-in candidates garnered 8 votes, but it is unknown whether one candidate won all eight or if it was spread among several or many. In the U.S. Senate race, George Allen claimed 131 votes or 62.1% of the votes cast while Tim Kaine captured 80. There were no write-ins in this race. Moving on to the 10th district House of Representatives, Incumbent Frank Wolf easily won this straw poll with 72.7% of the votes as compared to Cabral’s 24.9% and Chisholm’s 2.4%. As for the remaining contests, as the races were specific to certain cities and towns and likely unfamiliar to just about every reader, those results are not included in this report. So does tonight’s straw poll herald a victory for Republicans in Virginia in November? Or are a majority of the polls, which predict an Obama and Kaine, more accurate? In less than two months we’ll have our answer. VC Note: Earlier today, while at a meeting of the Valley Family Forum, I heard this political poem as read by its author, Angie B. Williams of Harrisonburg. I thought that her message was particularly appropriate as we begin the two-month countdown to the November elections. Can you imagine what kind of country we would have if every citizen chose to vote, not based upon labels and superficial attributes, but primarily guided by principle, reason, and the dictates of his or her conscience? I’m pleased to present Mrs. Williams’ poem to you and I hope that you enjoy her work as much as I have. Is ne’er more true than in the political bowl. And let your conscience be your guide. And what compromises are you unwilling to make? Be sure you reflect them in the vote you render. And consider his character before we begin. But integrity and judgment for the people’s sake. But who is best suited to lead our nation. We don’t have to align with our party of the past. For God holds us accountable for the vote we cast. And judge whose experience will rise to the top. Check the candidate’s voting record in the past. Just cast your vote, but never conscience forsake! © 2012 Angie B. Williams, Harrisonburg, VA. Used with permission. Although a small city in western Virginia, Buena Vista plays host to an important political event every Labor Day. Earlier today, politicians, their campaigns, and throngs of grassroots activists descended upon the community to participate in their annual Labor Day parade. 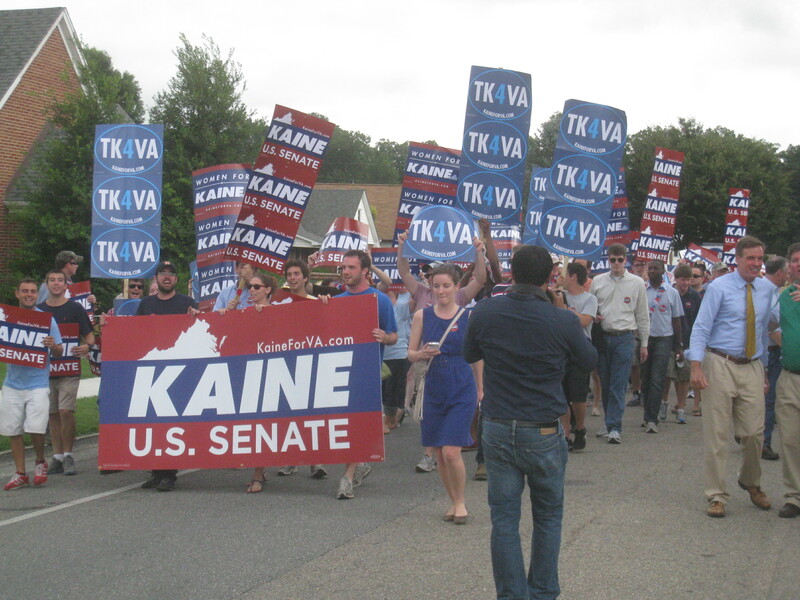 This year, attendees included: Senator Mark Warner, former Governor and Democratic Senate hopeful Tim Kaine, former Governor and Republican Senate hopeful George Allen, former Representative and Constitution Party Presidential candidate Virgil Goode, Representative Bob Goodlatte, and his Democratic challenger Andy Schmookler. The event had the one of the greatest concentrations of yard signs anywhere; from Interstate 81, the road into Buena Vista was lined. Along the parade route, signage was even thicker, forming a virtual fence between the spectators and those walking in the procession in many places. But which campaign was best represented in this aspect? 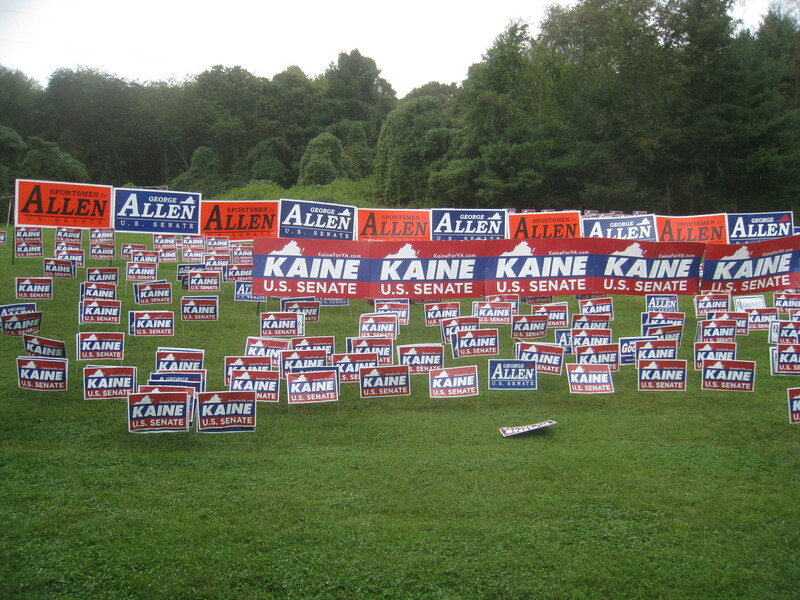 Of all of the candidates, Tim Kaine easily won the sign war; his total number of signs more than doubled his next closest competitor, George Allen, while Bob Goodlatte placed third. Curiously, there were relatively few Mitt Romney signs and close to zero for President Barack Obama. This trend could lead one to think that no one had much of an interest in the race at the top of the ticket. 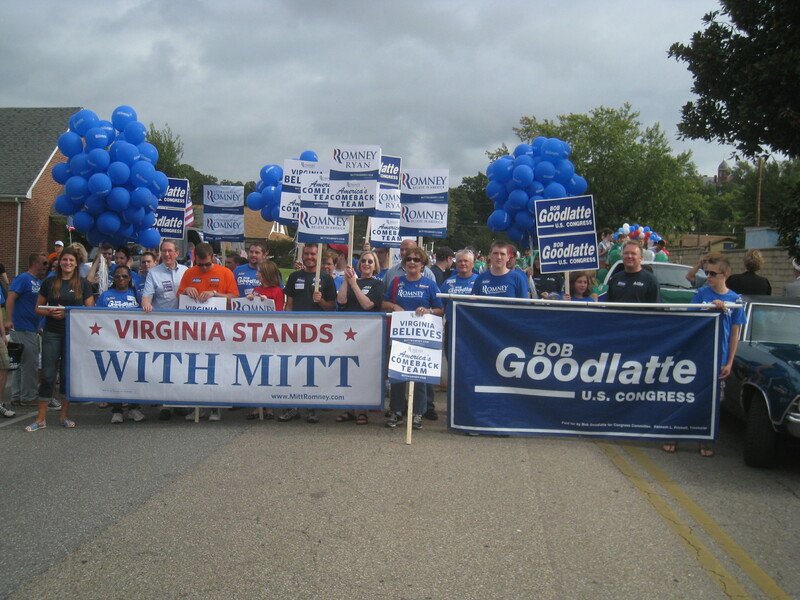 Unlike previous years where I promoted either a candidate or the GOP, today I walked in the parade on behalf of We rVirginia, a conservative grassroots organization based outside of Richmond. Although our group was considerably smaller than either the masses of Democratic and Republican volunteers, our folks were quite efficient, carrying our banner down the streets of Buena Vista while distributing hundreds of leaflets explaining both the purpose of the organization and comparing the stances of Barack Obama and Mitt Romney. As the Buena Vista Labor Day continues to grow in attendance and importance, it is becoming a virtual can’t miss event for those seeking office in either the 6th Congressional district or statewide in Virginia. Surprisingly, neither Lt. Governor Bill Bolling nor Ken Cuccinelli attended the gathering this year, but it is all but certain that whichever of these two men captures the GOP nod for Governor will have a huge showing in Buena Vista 2013 along with whoever wins the Democrats nominatation for Governor, as well as the various candidates for Lt. Governor and Attorney General. See you again in Buena Vista on September 2, 2013!